Knowing when a trend is going to end can be a very powerful and profitable piece of knowledge. For those with even a limited knowledge of the trading strategies that we teach you probably notice how consistently Smart Money (banks) tend to cycle the market is pushes of three over the span of 3-4 days. Understand just this small piece of information can keep you from placing a trade when the market has a higher probability of reversing. But what else can we use to more effectively predict when the weekly trend is going to reverse? This forex training article is going to be extremely valuable. In it we are going to completely cover a forex trading strategy that can stand alone, or you can use it along side any trading system you are already using. The strategy is what I call the Weekly Trend Exhaustion Reversal. Learning how to spot reversal is critical for many reasons. One key reason we all need to know how to spot reversals is to avoid fighting shifts in the trend that wipe out other traders. Second these reversals often get us in near the beginning of the three to four day trend thus allowing us to take high risk/reward trade setups. Before we discuss the criteria for this specific reversal trade setup we need to lay the foundation. 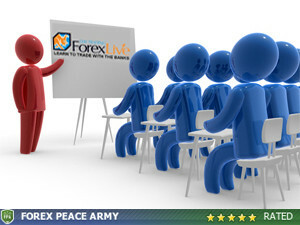 For those familiar with our forex bank trading strategies much of this information will be familiar. If you are new however, you may want to read other training article and videos on the site covering how to determine market trend. So then what criteria do we generally look for before considering market reversal? 1.) Do we have 3 clear cycles? 2.) Are those cycles moving at least the Average Daily Range (ADR), and preferably 90 pips or more each? 3.) Have these 3 cycles occurred over the course of 3 or 4 days? 4.) Was the overall move (From the start of the first cycle to the end of the third) at least 150 pips? Once this criteria has been satisfied the foundation for an “exhausted” market becomes established, and the possibility of a reversal begins to rise. Its important to remember that in trading we must be adaptable. There will be slight variations from the four points listed above and using some common sense goes a long way in those circumstances. 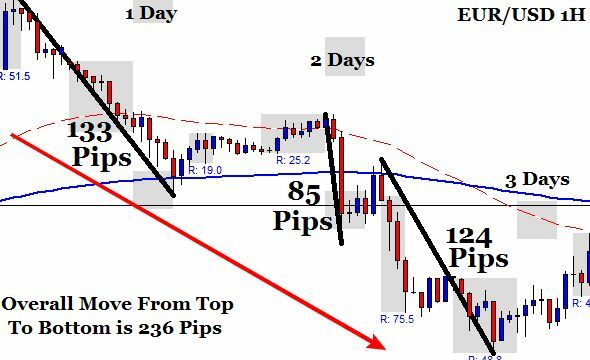 Let’s say for example that we see only 2 cycles but they are much larger than average both moving 160+ pips each, and it occurred over 3 days. We have to remember that some level of human intervention in trading is always necessary. It is important to remember why those rules are in place. They are in place to give us a set of guidelines as to how the market tends to trend on a weekly basis. Since all trends in the forex market are not the same it is more important to understand the principle behind the rules rather than a strict adherence to the rules no matter what. In general the most important part of the above rules are numbers 3 & 4. 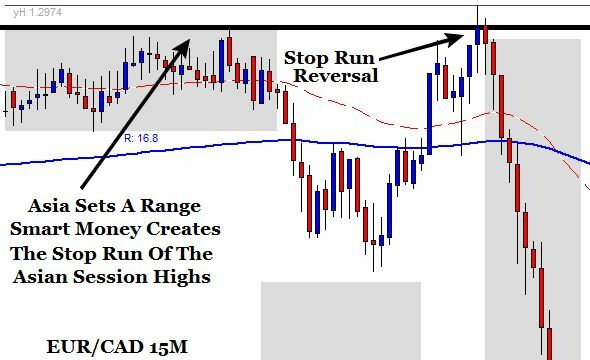 These two rules alone tend to more often than not make an adequate foundation to move forward from when determining possible forex trend reversals. We have to this point laid the foundation of when we should begin looking to trade a forex trend reversal. When though is the trade taken and what exactly are we looking for to signal a trade entry. One thing I always say to members is “we need to see manipulation at a high probability point” before taking a trade. In the example of a exhaustion setup I do as well prefer to see a high probability point (Major previous S/R level, 200EMA, Daily Pivot, ADR, 61.8% Fib, Cross Pair Confluence, Ect) being broken and then rejected away from. Unlike any other setup I take however, I will take these reversal trades without a high probability area….let me explain why. To explain why we do not have to have a high probability level during an exhaustion reversal setup we first must understand what the setup itself is, and what it looks like. Lets assume we have the “foundation” already set in place as we discussed earlier. 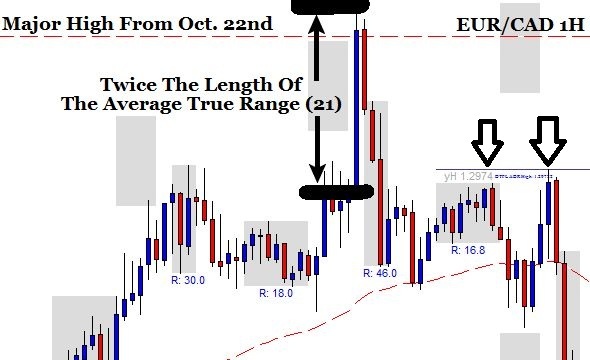 In order to be an exhaustion candle I want to see a 1 hour candle that is at least double the 21 period Average True Range to begin. There are times where the candle following the exhaustion candle will move up slightly, but in general to have a valid setup I want to see the market retrace the entire exhaustion candle before the following days Asian session ends at 2:00 AM Eastern. In the picture above the arrow second from the right marks the grey Asian box. The end of that box marks the end of the Asian session. Above is a perfect setup, and a great recent occurrence of this trend reversal strategy. The exhaustion candle is well over twice the 21 period ATR. Immediately after it closed the market begins to retrace, and easily retraces the entire candle. In the example above you can see I labeled a previous major daily high. As you can see the exhaustion candle breaks through that high, takes the stops, and then quickly gets rejected back down away from that level. Preferably there will be a major resistance or support level where the stop run can take place, but as I mentioned earlier that is not essential in this trade setup. Now that we have a basic understanding of what an exhaustion candle looks like lets explain why seeing that manipulation is not necessary in the trading strategy. This question is answered once we understand what is happening during this move and what the purpose of it is. In an earlier article series entitled learn to trade forex with smart money we broke down the very basic foundation of how the banks MUST trade. They first begin accumulating positions over the course of hours. Next they create manipulation in the form of a false push or stop run reversal. After this they then quickly snap the price back and start the trend in their direction, and the rest of the market begins to pile on after fueling the trade all the more. Therefore when they complete their weekly trend and the profit targets have been achieved they now have to exit this large position. Remember how it took them hours, and a manipulation move to enter their position? Wouldn’t it take the same to exit that position? Of course it would! How does moving the price up help allow them to exit their long position? If you are long how do you close out that position? Anyone in a long position must eventually sell that position back, and therefore they must have buyers to sell their position to. By allowing the price to move up it creates more buyers as it looks like the market is going to just make another push up in the already established up trend. This however is the trap! These manipulation moves are often created near the beginning of a major session opening. Generally from 2-5 AM Eastern or during the NY Session from 8-11 AM Eastern. Why is this done? In order to drive the market up they use what is referred to as general order flow. Remember banks primary job is to exchange money for global commerce to take place. During the overnight sessions massive amounts of general order flow (money that needs to be exchanged for general world wide commerce to take place) stack up and needs to be processed. On days where they look to create the trend reversal and in the example above exit their long position they simple begin aggressively pouring all the buy orders (client general order flow) into the market creating a rapid spike up. When this happens the rest of the market begins to pile on to the aggressive buying thinking they are missing the boat. Guess who is more than happy to sell to all those buyers? :) You guessed it the banks! The trap has been set, and the traders took the bait. They have done it in the past, they do it now, and traders will continue to take the bait in the future. Now that you know what happens during these exhaustion reversal setups you now know why it is not critical that a high probability manipulation point is broken. Banks break through high probability levels to take out stops and accumulate or exit positions. In these day trading setups however the move itself creates enough liquidity for them to exit their position therefore breaking through a high probability level is not essential. Its important to not be greedy. We could try to figure out a way to catch the exhaustion move itself but in general its much easier to take the trade the following day. Not only does taking the trade the following day give us time to really be sure were not forcing a trade, but it also gives the market time to provide even more confirmation of direction. How then is the entry taken the following day. In the chart below the grey box to the left is the same Asian session box you see in the charts above. The taller/skinnier box is the 8-11 AM Eastern NY session time block. In the chart above this is the 15 minute chart the day after the 1H exhaustion candle setup the day before. The trade is taken when we see a proper stop run or stop run topping formation above the Asian highs. If you are unfamiliar with the criteria needed for these two entries you can check out the forex training video on timing your entires. Within this trade setup we see a massive amount of confirmation. Not only did the initial exhaustion trend reversal itself show you the change in market direction, but the following day smart money creates the stop run or false push which validates the day trading setup and entry even more. At best you should expect to see this once a week per pair. 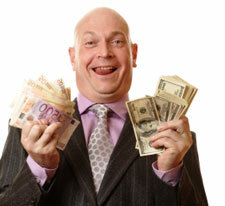 It you to trade forex and work a full time job, and do so with a sound and logical trading strategy. For those who cannot be around the following day to place entries manually, pending orders can be used above the highest probability manipulation points. This allows you to look at the market once a day after coming home from work. Like anything else it will take practice. Forex is anything and everything BUT a get rich quick scheme. It takes a logical and sound forex trading strategy to trade forex profitably. If you would like to learn how to trade the Trend Exhaustion Reversal setup you can check out our advanced forex bank trading course. Additionally in our members daily market review we list the highest probability manipulation points each and everyday. If you are struggling with doing so yourself you might find our daily market reviews useful. Next week I will more than likely be doing a training video on this strategy so make sure to look out for that. I hope you all find this trading strategy useful and I wish you all the best…Happy Trading! I totally agree with bobby. You guys rock! And, do so in a friendly, affable way. I look forward to the vid on this. You guys are awesome. Really glad to have found your info. I am so glad to find you guys! I am now a member for about a month. On member ‘s site, i tried to find recorded live trading since I cannot attend live.